Feeling uncomfortable about having your loved one's ashes turned into stunning jewelry? Here's another option for you! 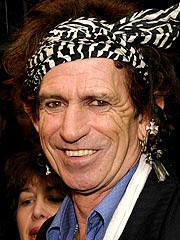 Keith Richards of the Rolling Stones admitted in a recent People Magazine article that 5 years ago, he mixed his father's ashes with cocaine and snorted them. The rocker told People, "He was cremated, and I couldn't resist grinding him up with a little bit of blow. My dad wouldn't have cared." They should have a Hall of Fame for Rock Star bad ideas. They could have a whole exhibit about Michael Jackson's "Slumber Parties" and clumps of Britney's old hair. *Thanks to Maridith for the tip. Scooter, you're a psychologist. What the hell does it say from a family systems perspective that he "couldn't resist" mixing some of his father’s remains with an illegal narcotic and then ingesting it? I don't think you need to be a psychologist to understand what this means dr bombay. I think gris gris summed it up nicely. Lulu, I think you've found your calling. This is a museum that someone needs to start ASAP. And ick, you shouldn't snort ashes of dead people. It's gross and it will probably give you asthma (if the drugs don't kill you first). rather telling of where he gets it from if he's right that his dad "wouldn't have cared." PR backpeddling aside, I bet he did it! And its just that kind of crazy that makes me want to see him as Johnny Depp's dear ol' dad in Pirates 3!